If you happen to be in Italy and on the hunt for an elaborate egg and bacon breakfast, then you can fuggedaboutit! For Italians, breakfast is not the elaborate affair common elsewhere. Mattia, who hails from Milan and is currently a manager at Ciao Bella, recalls breakfast in his native country as “an espresso and croissant” or some variation of coffee and pastry. While in Rome, a cornetto (a croissant with either custard or jam) is more popular, and after engulfing that in five minutes it’s off to work. “People are probably just uncomfortable with salt in the morning, sweet is usually desired,” says Mattia. 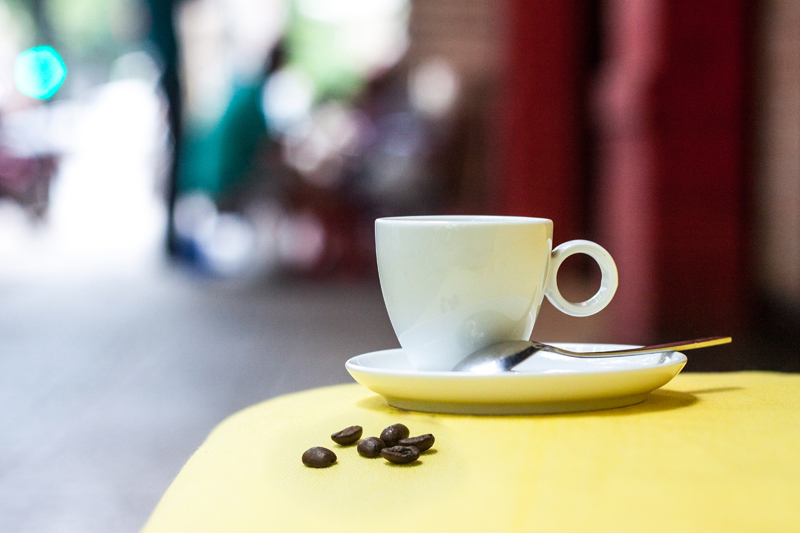 And if there’s not enough time for a pastry, then at least a coffee fix to start the day is essential. Italian rationale is that appetites are usually saved for later in the day when the food selection supposedly gets better as the day progresses. However, those behind Ciao Bella believe that breakfast time is the perfect start of the day to whet your appetite and brings to the table what an Italian breakfast would be if Italians actually had the time to sit down and eat before lunch. Having managed an Italian restaurant in New York, proprietor of Ciao Bella Tony Fox brings to Vietnam his version of Italian morning dishes with a Big Apple attitude. The Eggs Ciao Bella (VND195,000) is a dish that revolves around a large grilled polenta cake – polenta is made from ground cornmeal and water and was once reserved only for peasants – but here it’s the star of the meal. The kitchen whisks and molds polenta cakes 24 hours in advance for easier grilling the next day to give them a crunchy exterior while maintaining a softer, smoother interior. 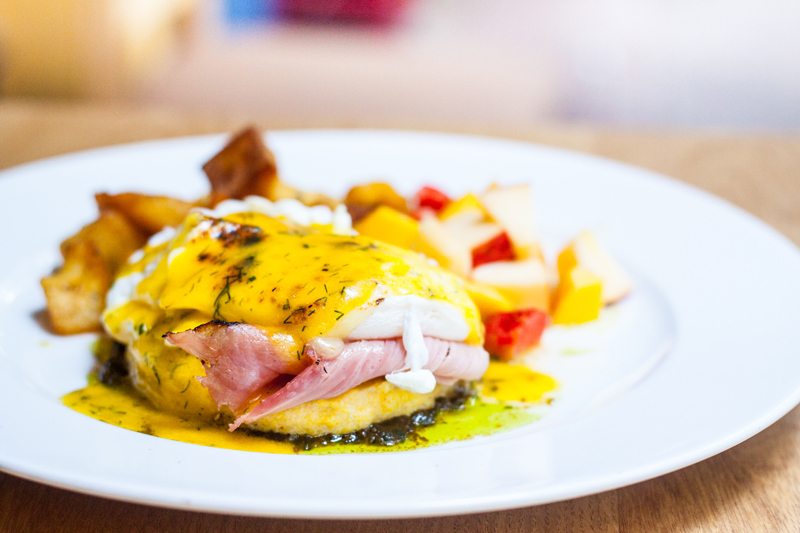 When served, the polenta cake is placed on a bed of basil pesto, topped with honey roasted ham and melted Fontina cheese, and finally paired with two perfectly poached eggs covered in Hollandaise sauce and Tuscan potatoes on the side. Mixed fruit is also included to avoid any potential overdose of savory flavors. This combination creates a rustic tasty breakfast. 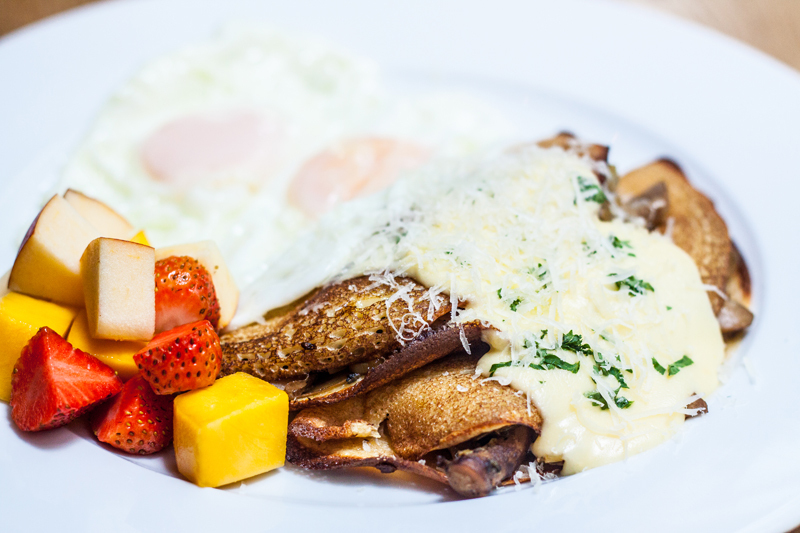 Inspiration comes from the American Eggs Benedict, “but the Italian part is all the Italian ingredients used to make this rich and creamy dish,” says Tony.